Raw Vegan Carrot Cake. 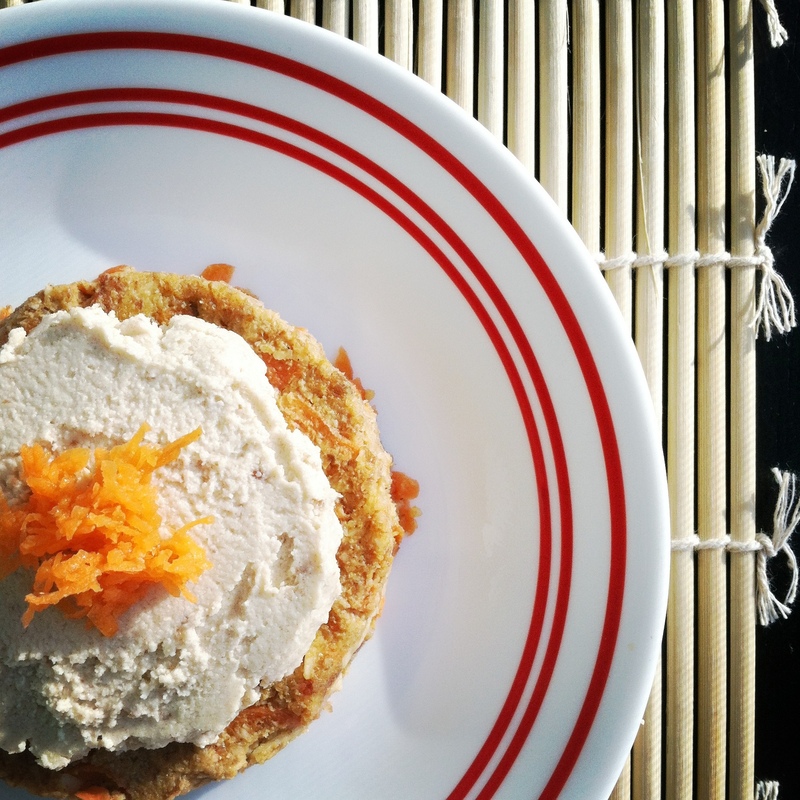 Cashew “Cream Cheese” Frosting Included…! | Eat More Plants. IT’S THE BEST DESSERT EVER. It could just be that I’m still new to the concept of raw veganism. This new concept of no-bake desserts has blown my mind. It’s truly amazing what you can make without using anything processed. Nothing fake, no processed sugar, nothing man made. Everything from nature. 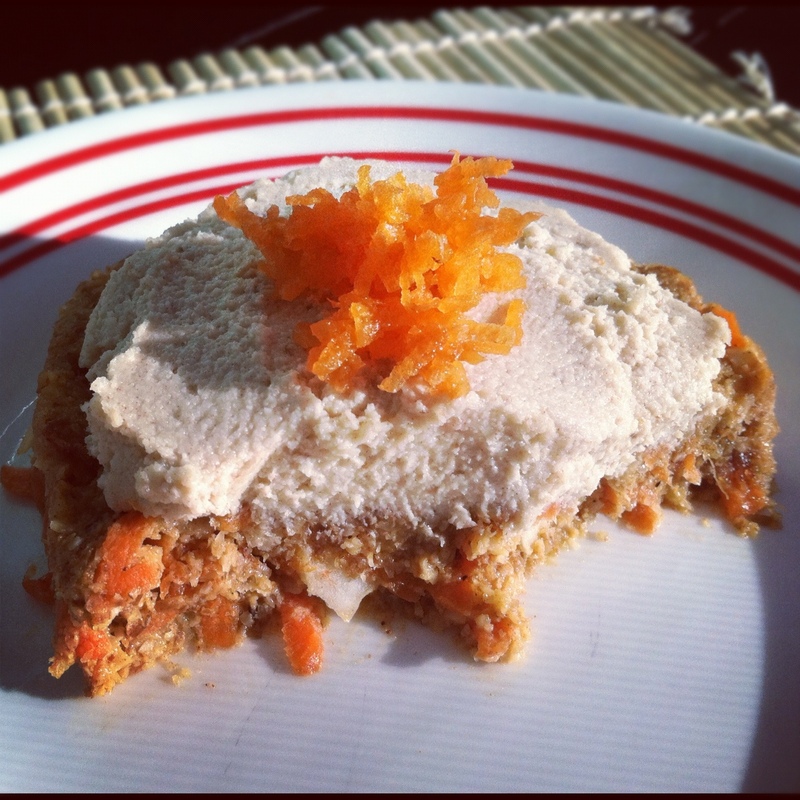 This recipe for carrot cake comes from a wonderful raw vegan blog just glowing with health. If I’m ever in need of inspiration for a raw meal, it’s one of the first places I look. Place the shredded carrots in a large bowl and set aside. Grind the pecans in a food processor with the S blade until finely ground but not into a paste. You want to retain a crumbly texture. Next add dates and raisins if you’re using them. Pulse until a dough is formed. Add coconut and process until evenly incorporated but still has some nice chunkiness to it. Add nut mixture to the bowl of carrots. Mix well either with your hands or a wooden spoon. Press mixture into a glass 8×8 pan lined with parchment paper. You can use any pan you like similar in size, or even a few small individual tart pans. Press the mixture down evenly and firmly. Place the pan in the freezer for 45 minutes to set. Blend all ingredients at high speed until thick and creamy. Add another T of water if needed. Pour into a bowl and refrigerate for an hour. Spread frosting on the cake and you’re done! Enjoy! This will keep you coming back for more, I guarantee it. I may have added more nutmeg and ginger than called for, just because I love a spicy cake. Maybe 1/4 t more for each one. OMG- you’re my new hero! I saw you on Instagram, and thought I’d take a peek at your blog. I went vegan last February and never looked back. The whole raw thing intrigues me- I even made a raw layered ice cream cake for Christmas! I’m definitely bookmarking you and gonna follow you on Instagram! Thanks you so much for sharing!